Math Mysteries for the HOLIDAYS collection. 1st Grade Edition. These fun math mystery activities will get your students excited about doing math! 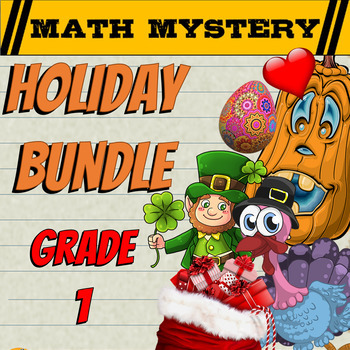 Save with this Math Mystery holiday bundle for Grade 1! Engage and motivate your students to review a variety of math skills with these ELEVEN fun math mysteries throughout the year. If you have any questions please do not hesitate to contact me on jjresourcecreations@gmail.com or use my store Q&A section. Please note: There currently isn't a video hook available yet for the 'Case of The Lost Leprechaun.' But the rest of the mysteries in this bundle do have an optional video hook that can be used to set the scene.